Bon Scrapatit Designs: HAPPY NOVEMBER AND A FREEBIE BE"CLAUS" IT'S CHRISTMAS!!! HAPPY NOVEMBER AND A FREEBIE BE"CLAUS" IT'S CHRISTMAS!!! Hi y'all!!! HAPPY NOVEMBER to you!!! Can you believe it??? EEEEEEKS! Only 53 more SHOPPING DAYS before Christmas!!! ROFL! Okay, sorry! LOL! I am probably amongst the worst of the "last minute" shoppers at Christmas time. Not because I LOVE the "adrenaline rush" mind you - it's usually that a few extra dollars trickle in somehow and I wish to make them count for those on my list!!! I am most likely going to be MIA for a few days as I'm working on a new kit for our weekly, "Scrap-A-Deal" at 3Scrapateers and I need to have it in the store by the 7th. Tonight's FREEBIE is a little special something from my new kit which I have entitled, "Be"claus" It's Christmas"! Now I just need to make sure I find a NICE Santa to add to the collection of goodies!!! Or, perhaps not .... whatcha think? HO, HO, HO, HO .... LOL!!! 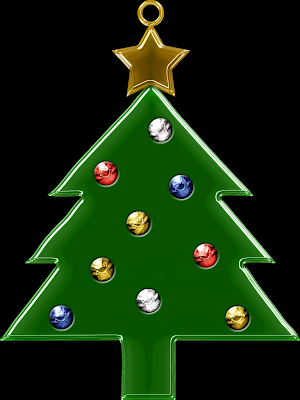 The Christmas Tree charm is approximately 4-1/2" x 6" so that you may reduce it's size without loss of quality. We are going out of town this weekend to visit TWO of our newest grandsons, Dillon James and Lohgan Maximus. Robert's number one and number three sons live only three blocks from one another and they have baby boys that are six months apart!!! How FUN is that going to be as they grow up!!! The boys live several hours from us and this is the FIRST time we are getting the opportunity to visit since Lohgan was born the middle of September. We are VERY excited, camera is ready-to-go and we are picking up the little guys, Wyatt and Garret so that they can meet their new NEPHEWS!!! You can bet I will come back with LOTS of photos to share!!! Well, I shall post a FEW anyhoo! Number two son also has a son who is in between Dillon and Lohgan and his name is Riley Nathaniel. Only trouble is .... Riley lives in Tennessee and we're all in California ... sniff, sniff. GOOD NEWS though - we will be visiting Riley and his mommy and daddy in February!!! WOO HOO!!! Look out Smokey Mountains, here we come!!! If I don't make it by tomorrow night, please have a GLORIOUS weekend everyone and may it be a SCRAP HAPPY one to boot!!! Hmmm .... boot ..... okay, gotta find a Santa and he's just GOT TO have BOOTS!!! Sweet dreams y'all and Bon Scrapatit!! !